Our club accreditation scheme, in association with McDonald's, helps us to grow the game, in a safe, effective and responsible manner. The aim of the scheme is to raise standards at every junior club in Wales' six area associations, so parents can be confident in the care their children will receive at their chosen clubs. We do this by ensuring they have more and better coaches, all certificates and licences are valid and correct safeguarding and procedures are in place. The scheme highlights and shares best practice and helps clubs to adhere to Government legislation. The FAW accreditation guidebook explains the criteria for clubs who strive for gold, silver, bronze or standard level accreditation and each club completes a workbook for the FAW and their area association to assess what level they're operating at, in terms of coaching, safeguarding and governance. Why does my club need accreditation? Put simply, without accreditation your club wouldn't be allowed to play. But it's far more than that. It's the best way to convince parents of potential players, coaches and volunteers that you are a well-run club that is attractive to join. 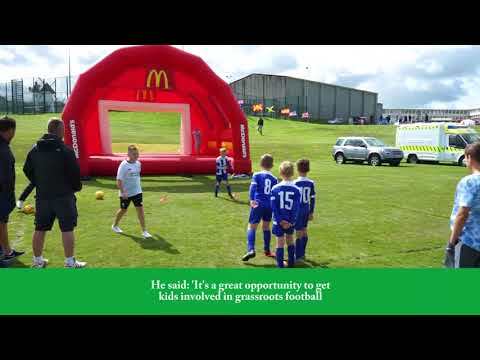 McDonald's Community Football Days: The best run clubs get the highest amount of funding to run community days, aimed at enticing more young players and volunteers to clubs. Star players like Ian Rush, Ryan Giggs and John Hartson have attended the showcase community days, which are offered to clubs with the highest level of accreditation. Publicity across FAW Trust channels: We like to share best practice to clubs, coaches and volunteers across Wales and will showcase our best performing clubs to an audience of thousands on our website and social media channels. Access to more funding: Sport Wales offers grassroots clubs funding through its Community Chest scheme and clubs with a higher level of accreditation will be looked upon favourably when money is being allocated. Sounds great, where do I sign? The first thing you need to do is read and understand the FAW Club Accreditation Guidebook, which contains the full accreditation criteria. Then you need to complete an FAW Club Accreditation Workbook, which is applicable to your FAW area association. Once that is completed, we can assess which level you are currently operating at and accredit you accordingly. Please contact us to get your guidebook or for more information.